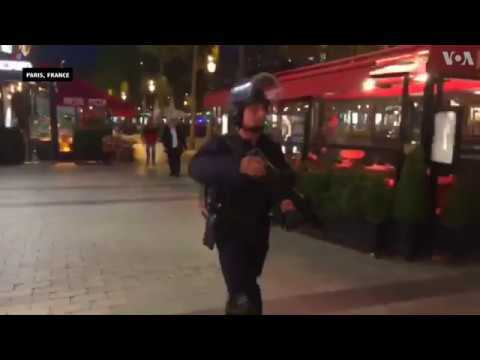 Paris police say the Thursday evening shooting that left one police officer dead and another one wounded in the famed Champs-Élysées shopping district was likely a “terrorist act.” The assailant was killed in an exchange of gunfire. A police spokeswoman told the Associated Press that the attacker shot at police officers standing guard near the Franklin Roosevelt subway station. The assault came three days before France votes in the first round of its highly contentious presidential election. During a joint press conference at the White House, U.S. President Trump said, Trump said the shooting “looks like another terrorist attack,” adding, “What can you say, it just never ends.” Read more. Their dumb president, Hollande, is all too busy condemning Israel for all their terrible atrocities against those poor downtrodden Palestinians. This bum keeps his borders open at all times. It’s time for the old war hero, the great John Kerry to fly over there and give them one big communal hug!